After developing for thirty years as a movement in the arts, after being disputed and celebrated, Post-Modernism has become an integral part of the cultural landscape. In this witty overview, Charles Jencks, the first to write a book defining the subject, argues that the movement is one more reaction from within modernism critical of its shortcomings. The unintended consequences of modernisation, such as the terrorist debacle and global warming, are typical issues motivating a Critical Modern response today. In a unique analysis, using many explanatory diagrams and graphs, he reveals the evolutionary, social and economic forces of this new stage of global civilisation. Critical Modernism emerges at two levels. As an underground movement, it is the fact that many modernisms compete, quarrel and criticise each other as they seek to become dominant. Secondly, when so many of these movements follow each other today in quick succession, they may reach a ‘critical mass,’ a Modernism2, and become a conscious tradition. Charles Jencks is the well-known writer, landscape designer and author of the bestselling The Language of Post-Modern Architecture (re-issued as The New Paradigm in Architecture, 2002). He has also written numerous other books on contemporary arts and building, including The Architecture of the Jumping Universe (second edition, 1997), The Iconic Building (2005) and is the editor with Karl Kropf of Theories and Manifestoes of Contemporary Architecture (second edition, 2006, also Wiley-Academy). His celebrated garden in Scotland is the subject of his book The Garden of Cosmic Speculation (2003) and in 2004 the Scottish National Gallery of Modern Art, Edinburgh, won the Gulbenkian Prize for Museums for his design, Landform Ueda. Preface - A refolution in five parts. Chapter 1 ORIGINS AND BATTLES. The Many Deaths of Modernism. Modernism as a Protestant Crusade. Complexity and the Enigmatic Signifier. Post-modern Art - Cross-coding with Content. Irony on the Verge of Cynicism. Chapter 3 THE BLURRED SOCIETY. The Rise of the Cognitariat. The Triumph of the Muddle Class. Cyclical, Linear and Crystalline Time. Chapter 4 WANING NATIONS, RISING HETERARCHY. New World Order as Heterarchy. Being Wise before the Event. One Cheer for the EU. The Search for an Effective Heterarchy. Chapter 5 COSMOGENESIS AND THE UNIVERSE PROJECT. Belief in a Universe 13.7 Billion Years Big. Complexity as a Measure of Quality. Critical Theory Carves up Doomsday Fatigue. Critical Modernism as a Continuous Dialectic. The White Elephant Theory of Modernism. The Ten-year Rule and Continuous Refolution. Critical Modernism - a Conscious Movement? 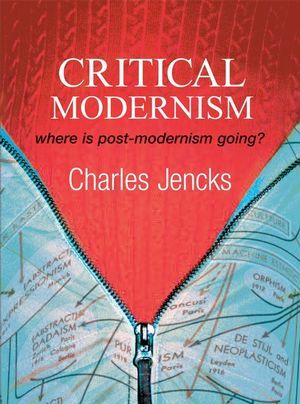 In the fifth edition of this seminal work, Charles Jencks updates the text applying what Post-Modern now means in a post-millennium world that has had to face such cataclysmic events, as 9/11, the tsunami, and Hurricane Katrina.